Welcome to Southern Pawn & Jewelry. Our pawn shop in Memphis was established in 2013, and we started with experienced pawnbrokers with over 20 years of experience in the business. We are proud to serve all of Memphis with our knowledgeable staff and we pride ourselves on the exceptional customer service that we provide to every customer. We offer to help assist with a short term loan on merchandise such as jewelry, TV�s, laptops and computers, gaming systems, lawn equipment, musical instruments, tools, sporting goods, and much more. We will loan you more than the competitors, because we allow you to build up credit when you pay on time and redeem your loan, which helps us loan you more money in the future. All loans are quick, easy, and confidential. 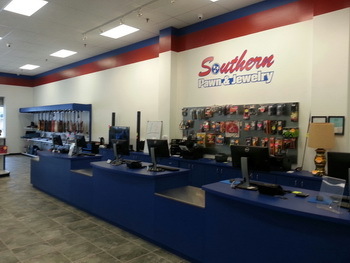 The shopping experience here at Southern Pawn & Jewelry is great as well. We have a large variety of pre-owned merchandise for you to purchase. All our merchandise is very clean and priced at a great value, and we have a convenient LAYAWAY plan that we offer as an option to purchase items. We stand behind our merchandise with a 30 day exchange warranty. Jewelry is a big part of our business. We loan top dollar on all types of jewelry and we also loan or buy broken or scrap jewelry. We have several showcases of pre-owned jewelry on display for sale, and the prices are extremely lower than any retail store. You have the option to LAYAWAY any item of jewelry. Jewelry sizing and repair is a service that we offer as well. Whether you are needing a quick cash loan until payday, or looking for a great deal on a wide variety of merchandise, come visit us first. "We Don�t Say No, We say YES!"